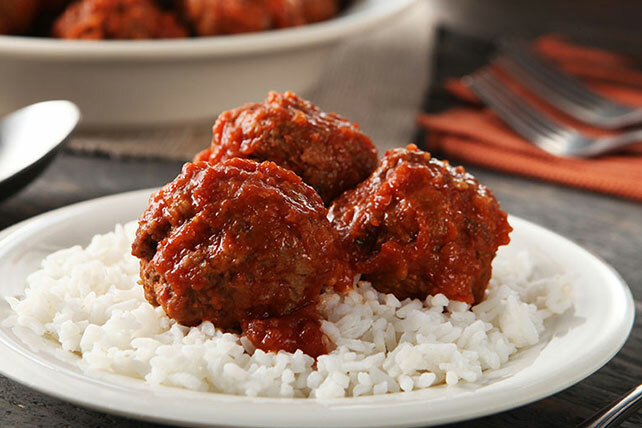 Meatballs get their spicy on in this quick-to-make weeknight dish, thanks to a flavorful tomato sauce made with chipotle peppers. Blend first 4 ingredients in blender until smooth; pour into large saucepan. Bring to boil. Meanwhile, mix all remaining ingredients except rice just until blended; shape into 24 meatballs, using about 1/4 cup for each. Drop meatballs gently into boiling tomato sauce; cover. Simmer on medium-low heat 20 to 25 min. or until meatballs are done (165°F). Serve with rice. Use a small ice cream scoop with a release mechanism to easily shape meat mixture into balls. The scoops lets you shape the meatballs without using your hands so there's less chance of spreading bacteria from the raw meat around your kitchen. Prepare using extra-lean ground beef and long-grain brown rice. When purchasing ground beef, always check the label to ensure that the meat has been ground on the day of purchase. If you can't use the meat immediately, wrap it tightly and freeze until ready to use. For best quality, use within 2 months.